I’ve been trying to get this post up for two weeks now. Instead of finishing the post I ended up taking one of our black kitties (we have two in the ten we’ve got), Merlin, to the vet. He has chronic sinus trouble and he’d been steadily getting worse for a couple of weeks. When he started to lose weight I got worried and took him to get checked. Well, bless his heart. Not only did Merp (my nickname for him) have a sinus infection but he also had two abscessed teeth. He was put on antibiotics with a shot that lasts two weeks (thank goodness cause Merlin is not a cat who takes his meds tamely) and surgery was scheduled for last Friday. The vet did not have to surgically remove his teeth because they were loose enough to be pulled. When I called to check on him they advised me they had removed every tooth in his head because they were all in bad shape. Good lord! To say the least I was stunned and honestly? A little freaked out. So now I have my toothless kitty at home and he is doing fine. He is eating canned food and a bowl of milk every day, gaining back the weight he lost. He’s still a bit snotty but that is nothing new. I really do not know how old he is, he was a stray I took in. He is such a laid back cat we call him ‘Cool Cat’. He’s one cool customer, nothing seems to phase him including very large dogs guarding their food. Nothing except taking his meds, of course. Lol. 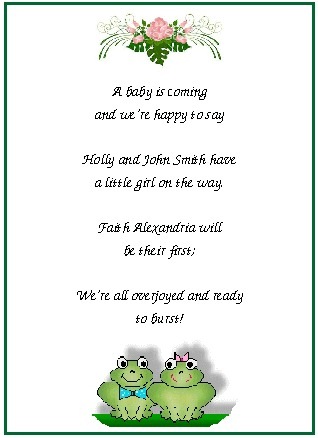 The rest of this and next week I’m working on things for the baby shower. I’m making a diaper cake, something I have never done before so I’m crossing my fingers it comes out ok. You know, not lopsided or burnt of anything. There’s a lot of information out there about making them and I’m combining the information from two posts I came across. Here and here if you’re interested. Lots going on. On the writing front I’m beta reading some things for my friend Theresa Bane. She and her husband, Glenn, have a short story coming out March 26 in buzzymag.com called “Prince of Lies, Marko Jaks: Balancing Act”. I have not read it but Terry has an interesting way of looking at things and it will be interesting. I thought I would share some of what I’ve been doing for the last two months. 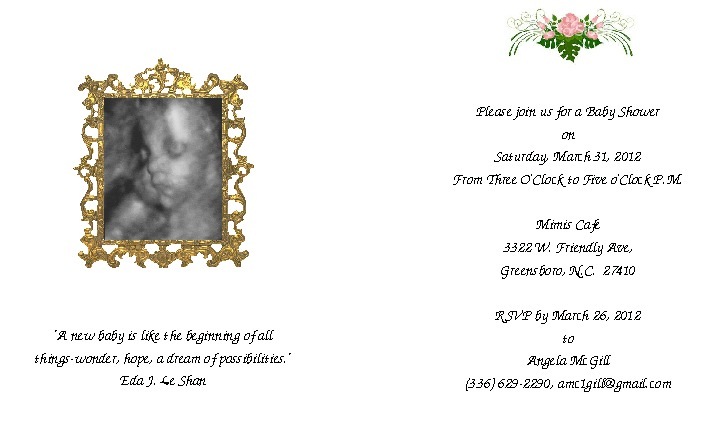 I decided to make the invitations for the baby shower myself to save money. Holly, Tracey and Gayle (Holly’s mother-in-law) all gave their input and we came up with a pretty darn good design even if I say so myself. Designing my own invitations for the first time was a labor of love. 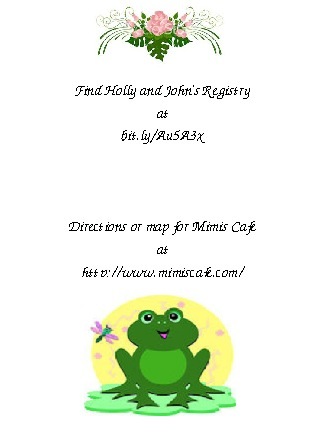 I lost hours at a time as I went through looking for clip art (making sure it’s free) to match our theme, roses and frogs. Yes, you heard me right. Holly loves frogs and we both love our roses so we combined the two. The results are rather pleasing, I think. Using an older version of Print Shop wasn’t that bad, just frustrating. For instance, I kept designing the card and the clip art kept disappearing. I thought I had my design saved only to go back and find it was gone. Gahhhhh! After many Braxton-Hicks tries I finally figured out I had to save the clip art as a jpeg before Print Shop would recognize and save it. The real labor began when Tracey, Gayle and I met and reviewed some of the designs I came up with along with deciding what information we wanted in the invitation. The end design didn’t match any of the original designs except in information. When I got home and went to work I came up with something totally different. After a final approval from my coaches I was ready to push print. Except I couldn’t find paper to match my envelopes or envelopes to match my paper. Grrrrrr! All that grunting and sweating and I still wasn’t done. I was ready to pull my hair out. You don’t have to ask my husband, my kids or my mother because I’ll tell you up front by this time I was a total crank. I even told my mother I couldn’t talk to her right then because I was too dang cranky. I wasn’t lying, it was all too true. Finally as I was talking to Gayle about my frustration she was like, oh so casually, well I have A2 envelopes here you can use. What?! I heard the angels singing. I went to her house to check them out praying all the way. Yes! They were perfect. I found some white cardstock to match and I was in business. For some reason I thought they had to be fancy envelopes or paper from the wedding or baby shower invitation section. I learned the teeth grinding way this is not the case. It doesn’t look like it here but I did make sure the clip art was the same size and was aligned on the pages the same along with the text on each page. Fortunately print shop had an appropriate font so that wasn’t hard at all, it was the easiest in fact. Last I made sure that frame around Faith was even; in several early versions of the card it was easy to miss how lopsided that frame was. I have a whole new appreciation for card designers. The poem on the front was a combination of a couple of different poems I found on-line. What I kept was changed to include names, etc. So I guess in the end the poem is sorta mine but not, if that makes sense. I found the quote under Faith’s picture when I googled quotes about babies. The invitation information was pretty basic and didn’t take long to work out. There you have my story of one of the longest labors I have endured, having my daughters was shorter. It was a little messy. I’m bald now and no one is speaking to me but I have my babies, my invitations born and I do like them. What they say is true, you do bond in the first few minutes of birth. So when’s the last time you snatched yourself bald in frustration? Or alienated everyone within speaking or phone calling distance? Do you like to do projects like this? Experts gathered together to discuss more on my favorite subject of vampires: Faith Hunter, Kalayna Price, Theresa Bane, Tony Ruggiero. We had lots of fun in this discussion. This is also the last post about Stellarcon. 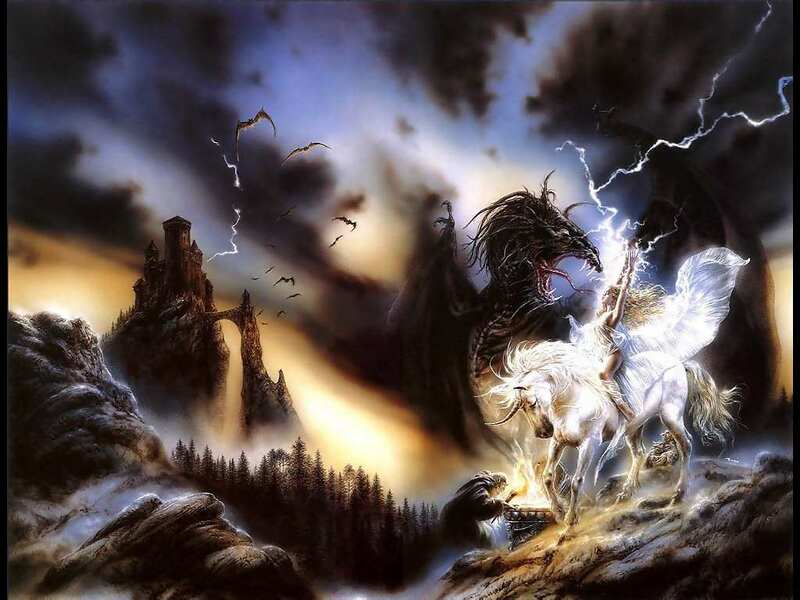 Theresa Bane is a Vampirologist and author of Encyclopedia of Vampire Mythology. “Vampires prey on the most precious in society,” explains Theresa. As an expert on vampires she doesn’t believe in the blood drinking fiends or the psychic ones. The concept of the psychic vampire evolved in the sixties from slang such as ‘negative energies’ or getting certain ‘vibes’. Those who practice vampirism are called lifestylers. The police call Theresa for help on some of their cases but her expertise is only with the vampire myth. Really? Modern day police actually have to know about vampires? She couldn’t tell us about any of the cases but talk about being freaked out. Instead of advising them to sharpen some stakes and approach said vampires only in daylight she advises them to call Michelle Belanger who is a lifestyler. I’ve seen Michelle in several specials on TV including: The History Channel, A&E and on the Reelzchannel Twilight specials.